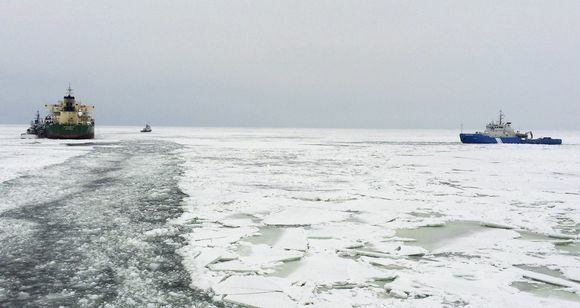 A cargo ship that started taking on water off the coast of Finland has been towed to a port in Tallinn, Estonia. Maritime rescue officials say no environmental damage was incurred. On March 8, Finland's Border Guard received a distress message from a cargo ship in waters south of Finland that its engine room was taking on water. A maritime search and rescue operation was launched the same day to pump the water out of the vessel. The ship's owners later made a decision to have the ship towed to Tallinn for repairs. "The damage is deep enough in the ship to prevent it taking on more water. The leaking section of the vessel has now been sealed off, so the water will not enter other areas. In this sense, the situation has stabilized," says Janne Ryönänkoski, an officer with Helsinki's Maritime Rescue Sub-Centre (MRCS). He says the Finnish Border Control's patrol vessel Tursas and the Estonian patrol vessel Kindral Kurvits are both at the scene. The damaged ship has a 22-member crew. "The crew has been on the ship the whole time and remains operational. There was no immediate danger that would have required evacuation, although our fleet was prepared for this scenario as well," Ryönänkoski says. The Glory Hongkong cargo ship flying the flag of Panama and was on its way to St Petersburg when it sent the distress message. At the time of the call, it was in international waters to the west of Suursaari island, off Finland's southern coast. Several metres of water had accumulated in the engine room. The MRCS Helsinki representative told Yle that the reason for the leak is still unclear. "It's impossible to say the reason at this stage because the engine room is full of water. It will be revealed as part of the repairs. The leak did not lead to any environmental damage, and no oil was leaked into the sea from the ship."